At Evans, we partner with our clients using Program Management Optimization strategies to help clients more effectively manage their large program. Our approach reflects an organization’s uniqueness, and effectively integrates our technical program management expertise with interpersonal “human-centered” skills necessary for program success. Our consultants specialize in implementing program management offices (PMOs), institutionalizing program management best practices, and delivering PMO strategy and execution support. 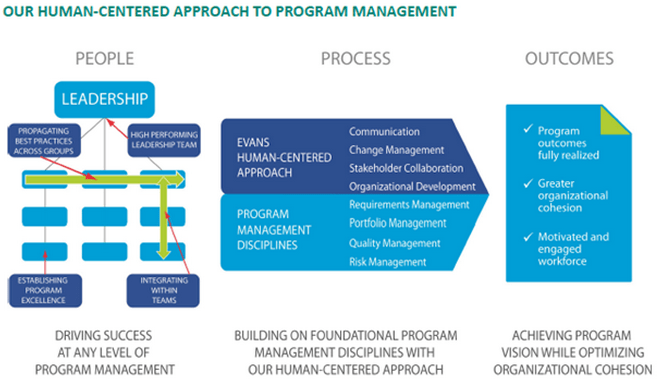 Evans understands how to optimize program management, and employs the right balance of strategic advice, diagnostic tools, tailored implementation strategies, and tactical support to ensure that our clients’ projects, programs, portfolios, and PMOs succeed.